Produktkategorie von Hoisting Equipment, wir sind spezialisierte Hersteller aus China, Lifting Equipment , Lifting Gear Lieferanten / Fabrik, Großhandel hochwertige Produkte von Lifting Devices R & D und Produktion, haben wir die perfekte After-Sales-Service und technische Unterstützung. Freuen Sie sich auf Ihre Mitarbeit! Heavy equipment is after reclaiming started vertical or perpendicular to both the horizontal stroke, arrive at the destination after unloading, and air travel to taking place to complete a cycle of work, and then a second lifting or handling. , arrive at the destination after unloading, and air travel to taking place, complete a cycle of work, and then a second lifting or handling. In general, lifting equipment, materials, transport and unloading is carried out in order, the appropriate agencies work is intermittent. From heavy equipment is mainly used for carrying goods, equipped with bucket can be handling coal, ore, grain, bulk materials, with the container after the lifting liquid steel and other materials. Some lifting machines can also be used to carry people. In some occasions, the lifting equipment or the main operating machinery, such as the loading and unloading of materials in the port and station crane is the main operating machinery. The elevator is composed of a walking mechanism, a hydraulic mechanism, an electric control mechanism and a supporting mechanism. Hydraulic oil by the vane pump to form a certain pressure, the oil filter, flameproof type solenoid valve, throttle valve, liquid control one-way valve, balance valve in hydraulic cylinder is arranged at the lower end of the, the liquid cylinder piston upward movement, lifting a heavy object, the hydraulic cylinder is arranged at the upper end of the oil return the flameproof type electromagnetic reversing valve back to tank, the rated pressure through the relief valve adjustment, through the pressure table observe the pressure gauge readings. Liquid cylinder piston downward movement, hydraulic oil through the explosion-proof solenoid directional valve into the upper end of the liquid cylinder, liquid cylinder back to the oil through the balance valve, hydraulic control check valve, throttle valve, explosion-proof solenoid valve back to the fuel tank. In order to reduce the weight of stable, safe and reliable braking, the return oil on the way to set the balance valve, balance circuit, to maintain the pressure, so that the decline in speed is not affected by the weight change, the throttle control flow, control the speed of the lift. In order to ensure the braking safety and reliability, to prevent accidents, increase hydraulic control one-way valve, that is, hydraulic lock, to ensure the safety of the hydraulic pipeline burst when the accident can be locked. Install the voice alarm for overload, overload or fault difference. Electrical control system through the explosion-proof button SB6 - SB1 to control the motor rotation, explosion-proof solenoid directional valve to keep the load increase or decrease, and through the "LOGO" program to adjust the time delay. Lifting equipment according to different structure can be divided into small light lifting equipment, lifts, cranes and other types of overhead monorail system. Light from a small heavy equipment mainly consists of lifting pulley, spreader, Jack, manual hoist, electric hoist and ordinary winch, mostly has the advantages of small volume, light weight, easy to use. In addition to electric hoist and winch, the vast majority of the use of human driven, suitable for the occasion of the work is not heavy. They can be used alone, but also as a crane lifting mechanism. Some light small lifting equipment lifting capacity is very large, such as hydraulic jack up to 750 tons of weight. Lift is mainly used for vertical or near vertical movements, with a fixed lift routes, including elevators, lifting platform, mine hoist and bucket elevator, etc.. Crane is in a certain range of vertical lifting and horizontal lifting of heavy lifting equipment. The use of various lifting equipment is different, there are a lot of differences in structure, but have to achieve the lifting of the basic movements of the lifting mechanism. Some lifting equipment also has the running mechanism, the variable amplitude mechanism, the revolving mechanism or other special working mechanism. The material can be made of wire rope or lifting chain flexible hanging lifting, but also by the screw or other rigid pieces of lifting. 1) lifting equipment is usually huge structure, complex, can complete the lifting movement, the level of movement. 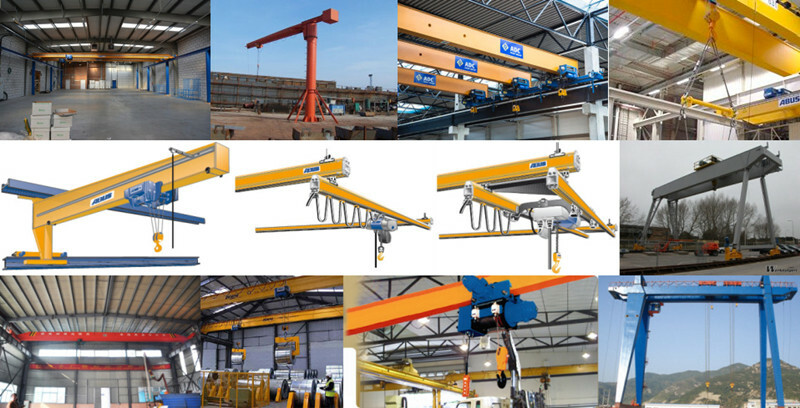 For example, the bridge crane can complete lifting, crane operation and the car running 3 movement; gantry crane can complete lifting, variable amplitude, rotation and cart running 4 movement. In the course of the operation, it is often the movement of several different directions at the same time, the technology is very difficult. 2) a variety of heavy lifting equipment, the load is changed. Some heavy weighing hundreds of tons but thousands, some objects up to tens of meters, shape is also very irregular, shot, hot melt state, inflammable and explosive dangerous goods such as lifting process is complex and dangerous. 3) most lifting equipment and need to run within the scope of a larger space, some should be installed rail and wheel (such as tower crane, bridge crane); some should be installed tires or tracks on the ground walking (such as automobile hoists, crawler cranes, etc. ); some need to walk on the steel wire rope, such as passenger and freight ropeway, activity space is larger than 4) some lifting machinery need directly carrying passengers on the guide rail, a platform or wire rope do lifting movement, such as elevators, lifting platform, its reliability directly affects the personal safety. 5) from exposure to heavy equipment, many parts, and often with hoisting workers directly contact (such as hook, wire rope, etc. ), the potential many accidental risk factors. 6) the working environment is complex. From the large integrated iron and steel enterprises to the modern port, construction sites, railway hub, tourism resort, there are heavy machinery in operation; workplace often in case of high temperature, high pressure, flammable and explosive, transmission lines, strong magnetic and risk factors, the equipment and operating personnel formed the threat. 7) in the heavy industry, often need to cooperate with the common. An operation, requires the command, banding, driving and other operators with proficiency, action coordination, mutual care. Operators should have the ability to deal with emergency situations. The close cooperation between multiple operators, there is usually a big difficulty. Article 1: all kinds of cranes should be installed, marked with the sign for the mechanical properties, and according to need to install the hoisting limiter, load controller, interlock switch device and rail mounted crane should be placed walking limiter and rail clamping, before use should check the trial lift. Second: the wire rope in the drum must be arranged neatly, the tail of the card, the work of the minimum retention of more than three. Third: shall not arbitrarily change the performance of the crane. Fourth: in the operation of the command to listen to the signal, the signal is unknown or may cause accidents should be suspended operation. Fifth: when lifting, lifting objects do not have to stop and walk. Article 6: lifting objects should pull ropes, speed should be uniform, smooth, no suddenly brake and transform the direction and lifting objects should be higher barrier about 0. More than 5 meters, whereabouts should slow light, prevent dumping. Seventh: when lifting objects, the ban stand on an object. Article eighth: the establishment of crane maintenance, regular inspection, safety regulations, and earnestly implement the relevant personnel education. Ninth: bridge crane should be set up full-time driver to drive, there is someone to be responsible for the hook and command (need to have the operating permit). Driving without a license and command. Tenth: the crane's working place should have enough lighting equipment and smooth transportation channel. Suspended from the head above the suspended. Eleventh: the obvious part of the crane indicates the maximum weight, prohibit overload use. No matter what is the industry, in the use of heavy equipment to make a safety check for the lifting equipment and lifting equipment were a repair and maintenance, timely detection of abnormal situation, and timely treatment, ensure heavy machinery safe operation, to avoid any accidents occur. Put some hidden dangers in the bud in the eradication of the state, so that not only is responsible for the progress of the project, but also responsible for the lives and property of the construction personnel. 1, check up the heavy equipment all types of protective cover, guardrail, door plate, ladder etc. whether complete, reliable, crane exposure may cause winding wounding, open transmission; coupling, sprocket, a chain, a transmission belt to rotate spare part protective cover, crane passage ladder and may cause personnel exposed parts of the door bar, whether to meet the requirements. 2, the open pit as a crane electrical equipment should be protected rain cover. 3, brake, brake pattern meets the design requirements, the brake pull rod, a spring without fatigue deformation, cracks and defects; pin shaft and the spindle, brake wheel, brake friction or excessive wear, hydraulic brake is oil; brake clearance adjusting system, ability can meet the requirements.